Allentown man attempts world's smallest Lord's Prayer hologram using a laser beam of light. HOLOGRAMS are so much more than 3D images. 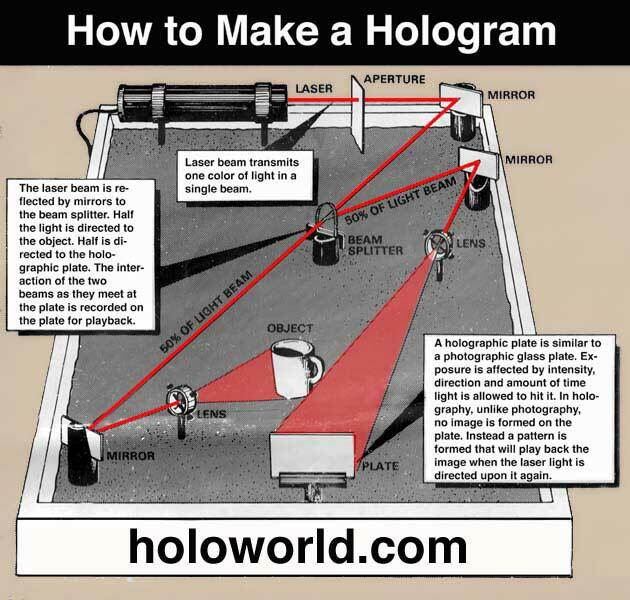 Using lasers, there are many other applications of holography. My attempt at the world's smallest Lord's Prayer is the diameter of a single human hair (100 microns). 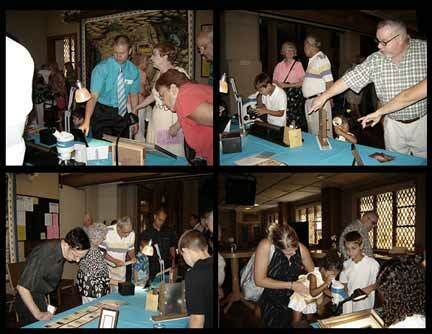 At its unveiling in 2013, seventy thousand people attended World Maker Faire at the New York Hall of Science. We were happy to have many of them stop by to see the display. 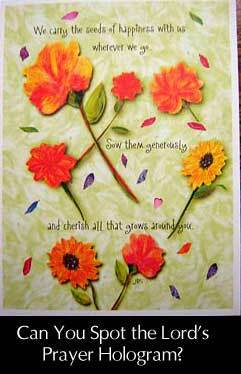 Each person received a souvenir card stating that "I viewed the world's smallest Lord's Prayer" as a keepsake. "An interesting side note, and a surprise to me, was meeting youth who had never even heard of the Lord's Prayer. They were seeing it, and reading it, for the very first time -- on a laser beam." Isn't that a beautiful prayer? This prayer was given as an example by Jesus Christ during his Sermon on the Mount. Many people, myself included, believe that it is a prayer for everything and everyone. And, since it came from Jesus himself (in Aramaic at the time), the words give it power -- and the ability to empower others through him. I know this personally for myself. In fact, there is so much that can be learned from this single prayer. However, for now, we'll concentrate on the world's smallest version of it. Let's continue . . . The Lord's Prayer at a Science Museum? : At my recent 2013 unveiling in New York, a young man asked me, "What is the Lord's Prayer doing in a science museum"? Therefore, you as a reader may be wondering the same thing. My response was (and is) that the Lord's Prayer has been shown in science museums and expositions for over 150+ years. Back then, it would come under the category of mechanical sciences, such as engraving with a reduction pantograph. After all, the late 19th and early 20th century was truly the industrial age known as the era of the machine. 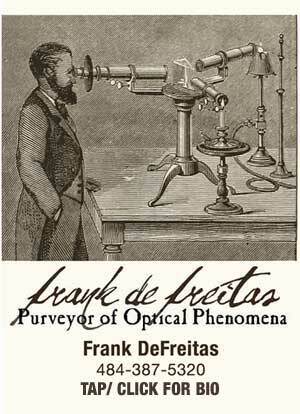 In today's 21st century world, and particularly with my attempt, it would fall under the physics of light (lasers), optics and holographic microscopy. In the future, someone else's attempt may one day fall under the category of interplanetary space communication technologies. With this history, the Lord's Prayer will always be appropriate in any science and technology setting -- even if only from an historical perspective. The Lord's Prayer and science are forever intertwined. which has the Lord's Prayer on reverse side. GUINNESS WORLD RECORD ATTEMPT: I applied to the Guinness World Record organization for the title of "World's Smallest Lord's Prayer". The application was accepted by them on September 18th, 2013, and I was assigned a project ID number. On September 26, 2013, I received notice that Guinness would not be pursuing my entry. There currently isn't a category, nor a current (or past) record holder, and they feel that "each record we verify must be standardizable and we do not feel that would be possible in this case." All-in-all, it was fun and exciting for the time that it lasted, and I thank Guinness for making that much possible for my attempt. I will continue to move forward. I will also continue to claim that it is truly the world's smallest Lord's Prayer until someone can claim (and prove) otherwise. light particles known as photons. The size that I'm giving is 100-microns for the image area, or the average diameter of a human hair. At its largest possible size, it would have to be less than 500-microns, since that is the diameter of the laser beam. 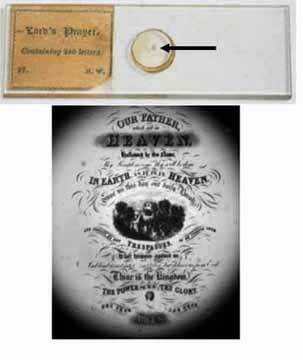 At BOTH of these sizes, upper and lower, it remains the smallest (known) Lord's Prayer on Earth today. Example of mid 19th-century microphotography (Henry West). These slides were enjoyed through microscopes. RECORDED AS A LASER HOLOGRAM: With Guinness, I would have been very curious as to how size verification would have been achieved with a hologram, since it is composed of nothing more than the interference pattern of coherent laser light. The Lord's Prayer exists as phase information only. In fact, it is completely invisible to the human eye until the hologram is oriented properly, and a laser beam is brought in to the hologram at a specified angle of incidence. I believe that this would have been somewhat challenging . . . even for Guinness (if I may be so bold to say so). Presenting an exhibit at my church. I would love to visit your church! One of the more amazing technical aspects of my own Lord's Prayer is that the magnification optics are 'stored' within the hologram itself. That means that no microscope is needed to view and read the laser reconstructed holographic image. 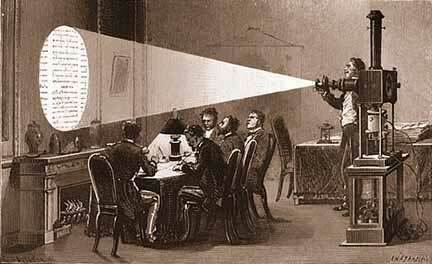 The magnification is recorded IN the hologram. In fact, this could have been done via more traditional photographic methods if not for the self-contained optical magnification. Since a hologram can record 3-dimensional information about objects (phase information), it can also store lenses and mirrors. The holographic lenses and mirrors will function just as they would in the physical world. Therefore, the Lord's Prayer can be magnified greatly, projected onto a wall, ceiling or screen, even though the image area is only microns in size. 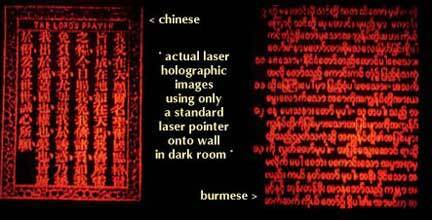 With enough laser power, the world's smallest Lord's Prayer could be projected onto the side of a building -- all from the optical information within in the hologram itself. 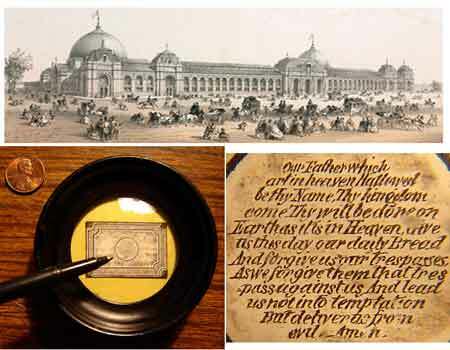 and can be viewed in my exhibit room in Allentown, Pa.
HISTORY OF SMALL LORD'S PRAYERS: There is a long history of making the smallest Lord's Prayer (one of the earliest is shown above). I have been able to trace this history back to the 1800's, but the highest concentration of attempts were from the first half of the 20th century. It continues even today. The mechanical technology is extraordinary, so I am very honored to be a part of that history with my own attempt using lasers. Many examples were also made via hand engraving under a microscope. Early (1921) micro Lord's Prayer on display in my collection. (above photo): This didn't arrive in time for NY, but you can see it now in my collection / exhibit room (or during one of my future presentations). 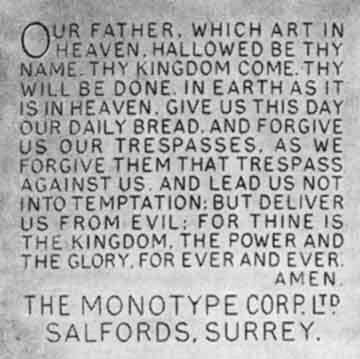 It is a single 1921 Monotype type casting of the Lord's Prayer. It was hand-cut (mechanical) by type engraver Charles H. Beeler, (1855-1934) on a pantograph machine of his invention and making. It was cut at the Typographic Dept., of the Lanston Monotype Machine Co., in Phila. Pa. (walking distance from where I was born and raised.) The letters are 56 ten-thousandths of an inch in height. On the left I am showing the very tiny end where the Lord's Prayer is cast; on the right is the same end under the microscope. Very Early (1840s) micro Lord's Prayer on display in my collection. Micro Engraving by Ephraim W. Bouvé, Boston, c. 1840s. The micro Lord's Prayer is in the very center circle area. (above photo): An astonishingly beautiful typographical hand-engraving by Ephraim W. Bouvé, Boston, 1840's. One of the earliest in my collection. The small circle at the very center contains yet another (second) rendition of the Lord's Prayer that is microscopic (reads beautifully under the microscope). I continue to add to my collection of world's smallest Lord's Prayers, which includes my own laser micro hologram, the image area being the width of a single human hair. 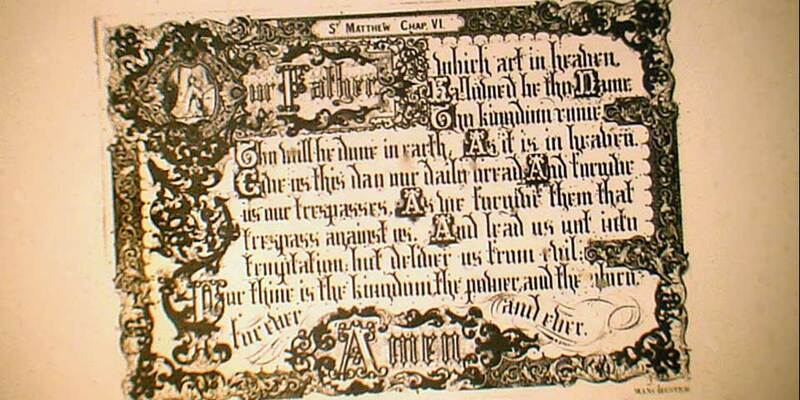 The Lord's Prayer has been used as the de facto reference standard for competitions for over 150 years. 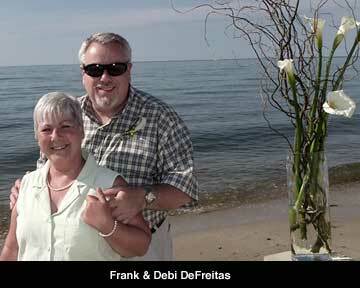 My wife Debi and I together since 1975. A few famous names that I've been able to find online include: Ephraim W. Bouvé (1840s), Henry West (1858), William Webb (1862), Paul P. Wentz (1907), Godfrey E. Lundberg (1915), Charles H. Baker (1915? ), Charles Henry Beeler, Jr. (1921), Fred C. Knapp (1935), Graham Short (2010). 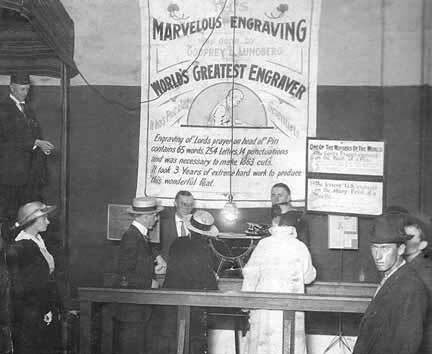 Then there are equipment manufacturers such as the Lanston Monotype Co. (1921), American Type Founders and the Benton Matrix Engraver (1922), and Thomas Alva Edison (year TBD). 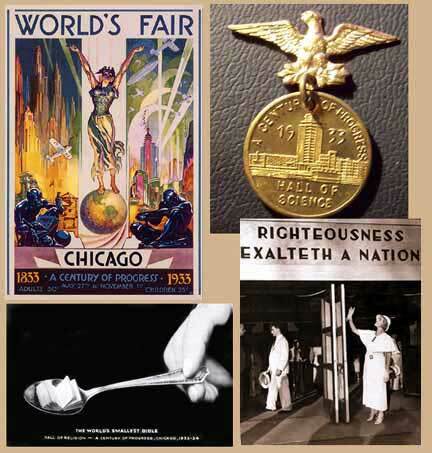 I hope to have links to this historical information very soon, and would appreciate any additional information about any of the persons and companies involved, as I build out my world's smallest Lord's Prayer history archive. 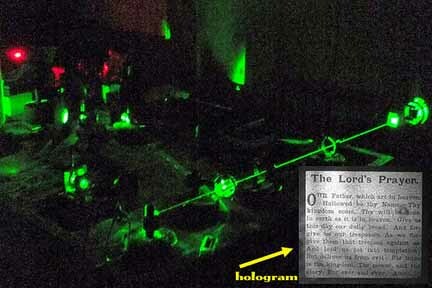 Lord's Prayer are recorded directly in the hologram itself. When I set up my display and welcomed viewers I remember that I am following a line of tradition that dates back for over a century. Out of all of the laser holography work that I have done over the past 30 years, this is the legacy that I wish to leave behind ... and to go into the future. This is my Guinness World Record entry (magnified). Its width is the size of a single human hair. I feel very strongly that everything that I have done with my life in holography (30 years) has led to this very moment. Everyone has something that they're meant to do, and this has turned out to be mine. Every project of the past, every public presentation, was but a stepping stone in preparation for the greatest of them all: The World's Smallest Lord's Prayer. These micro holograms can be invisibly embedded. where the Holy Bible is banned. ** There are no electronics involved in its creation, no computers, monitors, storage devices or apps. 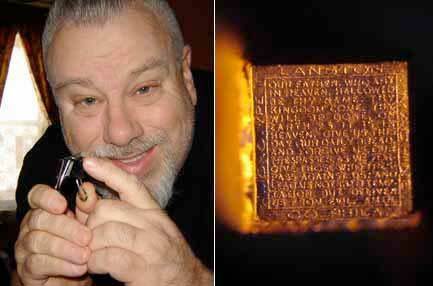 ** I created the Lord's Prayer in 2012, in my own laser laboratory of 30 years. I designed and built most of the equipment. 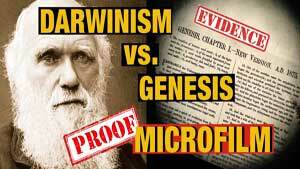 ** At its most basic, it is a combination of micro-holography and very early analog holographic data storage. 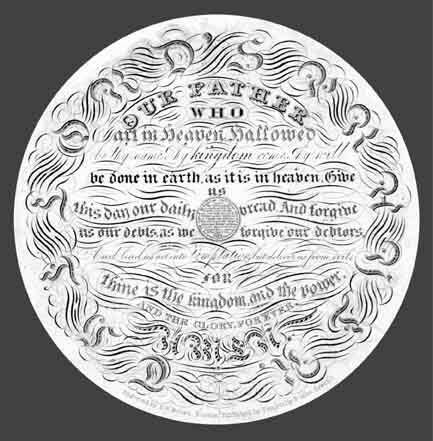 ** The text for the Lord's Prayer was recorded from a 19th century Magic Lantern glass slide by Newton & Co., Covent Garden, London. ** An air-cushioned vibration isolation system had to be used to make the laser recording. This was built by hand. ** To reduce noise and vibration, work had to be carried out in the overnight hours. ** Nothing on the table surface could vibrate more than a fraction of a wavelength of laser light, or the recording would be useless. ** Its size (image area) is the approx. width of a human hair (100 microns). The largest possible image area would be 500-microns. A simple hologram recording set-up. ** The magnification is self-contained. No physical microscope or enlarging optics are needed to view. ** The optics needed to magnify the image are recorded within the hologram itself. ** The Lord's Prayer travels on a beam of pure light from a laser. ** The constructive and destructive interference pattern from the coherent laser light is recorded in the 532 nanometer range. ** The Lord's Prayer can only be viewed by those who know the proper hologram reconstruction orientation and laser beam angle. 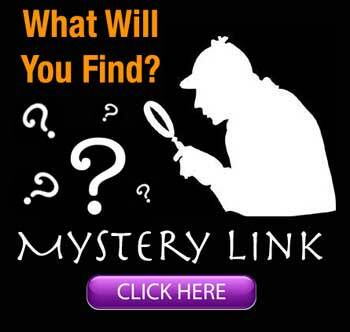 ** It can be sent, with any Scripture, completely undetected anywhere in the world. 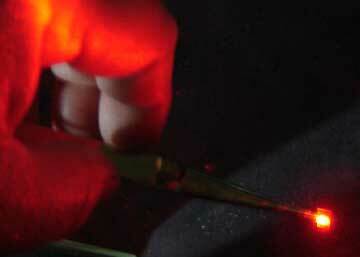 ** Although it required a laser laboratory setting to make, it can be demonstrated easily to the public. ** Young and old are fascinated to see it! Experimental Lord's Prayer(s) with foreign languages.